"This Bolognese sauce is dedicated to the late great Marcella Hazan. 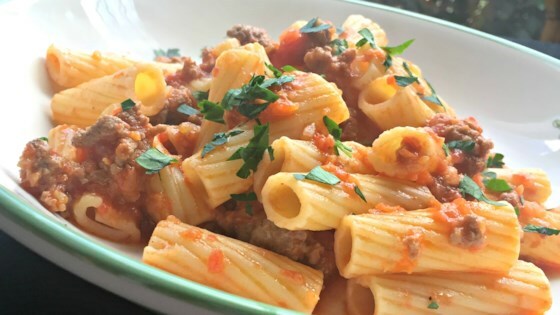 She was considered the Julia Child of Italian food, and at a time when most Americans thought 'Bolognese' was spaghetti sauce with chunks of hamburger, Marcella taught us just how magnificent this meat sauce could be. I like to toss it with some mezzi rigatoni and serve it with a little grated Parmesan cheese and a sprinkle of parsley." Melt butter with olive oil in a large saucepan over medium heat; cook onion, celery, and carrot with pinch of salt until onion turns translucent, about 5 minutes. Stir ground beef into vegetables and cook, stirring constantly until meat is crumbly and no longer pink, about 5 minutes. Season meat mixture with 1 1/2 teaspoon salt, black pepper, cayenne pepper, and nutmeg. Pour milk into ground beef mixture and bring to a simmer. Cook, stirring often, until most of the milk has evaporated and bottom of pan is still slightly saucy, about 5 minutes. Raise heat to medium high and pour white wine into ground beef mixture; cook and stir until white wine has mostly evaporated, about 5 more minutes. Pour tomatoes with juice into a large mixing bowl and crush them with your fingers until they resemble a slightly chunky sauce. Pour tomatoes into sauce; fill can with 2 cups water and add to sauce. Bring to a simmer. Reduce heat to low and simmer, stirring often, until mixture cooks down into a thick sauce, at least 3 hours but preferably 4 to 6 hours. Skim fat from top of sauce if desired. If sauce is too thick or too hot on the bottom, add a little more water. Taste and adjust seasonings before serving. I followed the recipe without making any changes and the flavour was so very different to the "meat sauce" I've made in the past. Certainly more time consuming but worth it!